Mongolia has a mixed Parliamentary-Presidential system of government. The President is Commander-in-Chief of the Armed Forces. The Prime Minisiter, as head of government, sets policy, including defense policy. The civilian Minister of Defense reports to the Prime Minister. The President chairs the three-member National Security Council which is empowered to make defense and security decisions. However, all decisions must have the concurrence of the other two members of the council, the Prime Minister and the Speaker. The uniformed Chief of the General Staff - a Lieutenant General - reports to the President, as well as to the Minister of Defense. The efforts towards subordinating the military to civilian command authorities have been successful. A defense auditing agency monitors compliance with regulations and control of resources. It is made up of civilians and answers directly to the Minister of Defense. The Institute for Strategic Studies, which researches and develops policy positions on strategic issues for all branches of the government, is also subordinate to the Minister of Defense. The staff is a combination of civilian and military researchers with extensive training abroad. The Mongolian Armed Forces (MAF) has an active program of study with the us center for civil military relations. The Ministry of Defense is the professional managing body of the Mongolian armed forces, and this body is responsible for reliably maintaining the country’s independence and its entire territorial and human security. This is done on the basis of creating a unified political, economic, social, legal and military system for defense, based on local defense mechanisms and to ensure that the armed forces are profession-oriented and skilled. The Ministry of Defense is also coordinates the provision of strategic planning and policy guidance, reforms armed forces structures and organizations, builds the army’s capacity to engage in both peacekeeping and war-time activities, and undertakes special duties to maintain conditions for peace and stability. The goals of defending the country with military power have been achieved within the framework of more than 30 laws and regulations, including the Law on Defense and others. Since 1992, external military collaboration has been intensified and foreign assistance to implement military reform has been extended, and, until recently, a total of US$ 54 m assistance has been provided by foreign countries. The Government of Mongolia has concluded agreements on its defense sector with over ten foreign countries. The objectives of external relations and collaboration implemented by Mongolia’s defense sector are: to form a unified system to maintain national security through political and diplomatic channels, advance the military system to international levels, create an enabling external environment to establish a profession-oriented, compact and skilled armed force with structures and organizations appropriate for both peace and war-time duties, increase participation by the armed forces in international activities, and strengthen its attitude and reputation at international levels. The Sector has exchanged military representatives and has concluded agreements to expand defense collaboration with over ten countries, including the Russian Federation, the USA, the People’s Republic of China, Federal Republic of Germany, Turkey, Republic of Korea, India, Belgium, France, Ukraine, Bulgaria and Kazakhstan. Consultative management meetings have been organized with the Russian Federation, the USA, the People’s Republic of China, and the Federal Republic of Germany, with which views were exchanged in regard to regional security, perspectives on bilateral defense relations and other issues of common interest. Mongolia dispatched its first military contingent of 250 soldiers to Sierra Leone under a UN mandate and this raised the reputation of Mongolia’s armed forces worldwide. A further military group of 39 soldiers was sent to Kosovo for peacekeeping purposes. On December 29, 2011, Mongolian Ministry of Defense celebrated its 100th anniversary. In 1911, Mongolia’s state gained independence from the Manchu empire, and established its first five ministries. One of them was Military Ministry which led by Gombosuren. The Ministry has played a significant role in protection of state security and independence. The Ministry of Defense announced that the cerebration of the 100 anniversary would be conducted throughout a year. Many organizations and Armed Forces units planned and implemented useful and important measures for the anniversary. 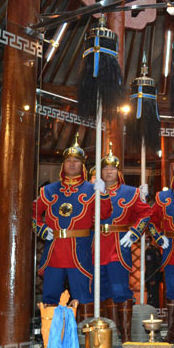 For example, Mongolian Soldier’s Museum has created new performance about ancient weapons for its visitors. Ministry of Defense planned all military festival in the beginning of September 2011. Also working groups have been creating documentary movie and photo album. Great Black Banners ceremony takes place every two years. Tribute is paid to the military Great Black Banner in order to regain the spirit, flourish the strength, knowledge and courage of the state and soldiers. The ceremony also aims to form the public opinion of patriotism to love the independent country of Mongolia, to be proud of the ancient heroic warriors and soldiers as well as the Armed Forces of Mongolia. In 2011 the tribute ceremony was on the mountain, south east of Ulaanbaatar. In the previous year the ceremony was on the mountain Uguumur, 50 km west of Ulaanbaatar. The ceremony was attended by President of Mongolia, Minister of Defense, Chief of GSAF, and other officials. The “Great Black Banner” is unique in Mongolia and is respectfully taken out of its Palace only for the worship and offering ceremony. It is prohibited to drop and lower the banner. Only authorized Banner Bearer can touch, carry and move it. The Great Black Banner (Bunchuk) was the traditional symbol of Chinggis Khaan's Military Force. It was renewed in 1992 and has been considered and used as the symbol of All Militants of Mongolia since then. The renewed Black Banner is created by skilled craftsmen using 180 gram of pure gold and 300 gram of white silver provided by the Mongolian Treasury Fund, stones from ancient Mongolian capital.